The etchings all started as urban sketches at each location referenced by the corresponding poem. I had a fun time inviting my urban sketchers meetup group to draw the places with me that I had chosen to illustrate. Once I started etching, I realized that I didn’t need to, nor want to create the draft sketches in great detail. I prefer to work out the details straight on the copper plate, rather than copy everything over from an “original”. Copying would remove the possibility of letting things happen as I respond to the medium. However, I did want the images to be recognizable as Vancouver scenery. So I used my ability to draw realistically, but threw in some visual reminders that these are drawings, and are not trying to imitate photography. Below are all nine etchings I made for Getting to Know You by the poet Christopher Levenson. These images are from state proofs, a couple of the copper plates will have slight touchups that were not yet done here. Click on each image to see an even larger resolution version. The project is explained in detail in this earlier post. And you can still pre-order a book here. 2013 has been one of the best years of my life. 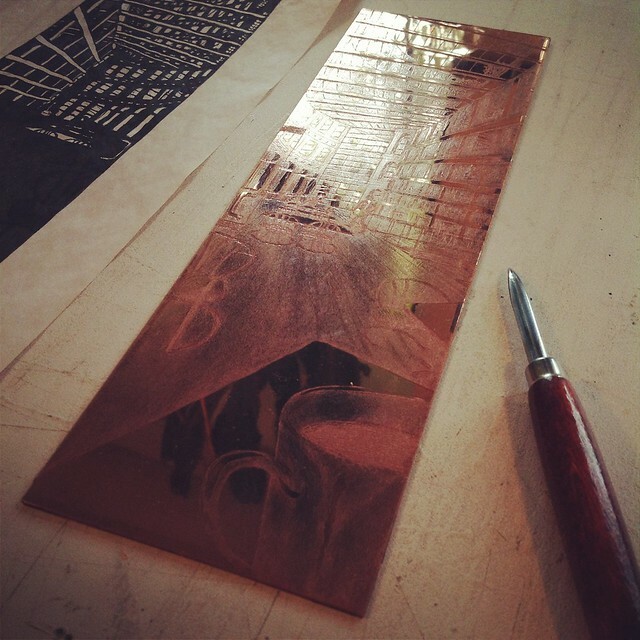 This copper etching project did it; that, and the Vancouver urban sketchers! I can only hope that 2014 will be as wonderful. Here are the spreads showing 4 out of nine illustrated poems from the Vancouver poetry book by Christopher Levenson, Getting to Know You. Click on each spread to view it larger. There are another nine poems in the book which are not illustrated, for a total of 18 poems. New Leaf Editions is pre-selling the hand-printed, limited edition (30 copies) poetry books, as well as a broadsheet consisting of one poem and one illustration, and etching lessons, on indiegogo.com/projects/getting-to-know-you. In the next post I will show all 9 etchings in detail. The collaborative poetry book project between the poet Christopher Levenson, the master printer Peter Braune, and me is nearing completion. At least my part, the creation of 9 copper etchings, is pretty much done. The printer still has a lot of work to do, printing this 40-page book as an edition of 30 copies. That’s 1,200 pages of hand-printing! Well, not quite, as a few pages remain blank — but not many. New Leaf Editions is pre-selling the hand-printed, limited edition (30 copies) poetry books, as well as a broadsheet consisting of one poem and one illustration, and etching lessons, on indiegogo.com/projects/getting-to-know-you. 1. This is the very first etching I’ve ever done, on a 3.5″ x 11″ copper plate, of the Vancouver Public Library, using hard ground and aquatint. 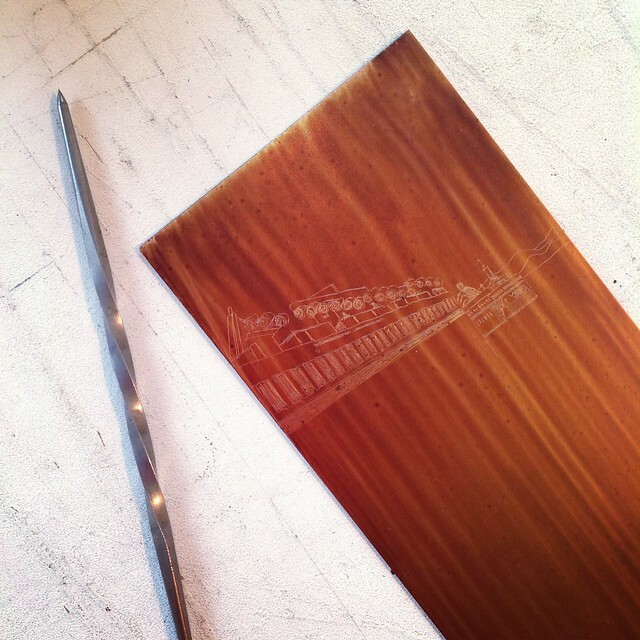 The burnishing tool on the right is used to smooth out the aquatint surface, creating brighter highlights the more the copper is burnished. 2. Below is the beginning of my second etching, again in the 3.5″ x 11″ format I have chosen for all the etchings in this book, of the BC Ferries Terminal in Tsawwassen (south of Vancouver), using hard ground and aquatint. The drawing needle on the left is used to draw lines into the hard ground surface which is brushed onto the copper plate first, then allowed to dry. Drawing on hard ground requires only a light touch, and is different from scratching directly into the bare copper plate; that is called drypoint. 3. 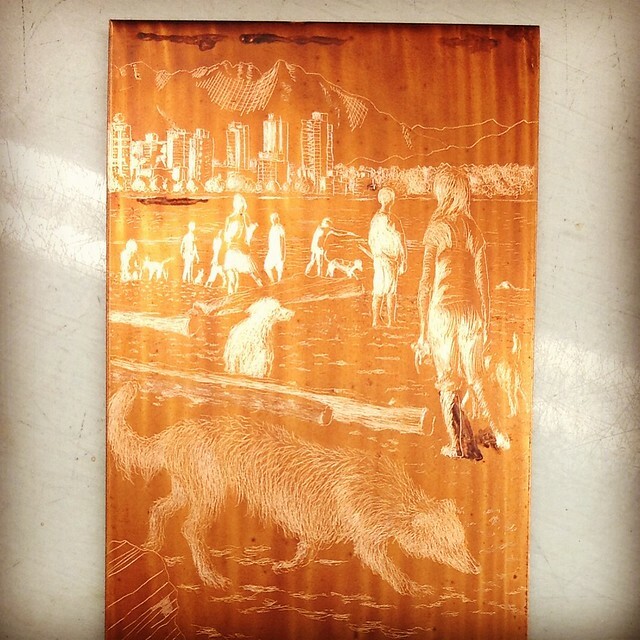 This image below shows another copper plate etching in progress, with an image of the off-leash Dog Beach in Kitsilano, Vancouver, using hard ground and aquatint. You can see where I’ve gone back into the plate with more hard ground to paint over the woman’s leg that I had placed too far back, and then re-drew it with a needle. Drawing on hard ground with a light touch allows you to cover up mistakes and redraw them. You are not scratching into the plate, you are just removing hard ground. The etch comes later, and then the lines get etched into the plate and are not easily removable, except by vigorous burnishing. 4. 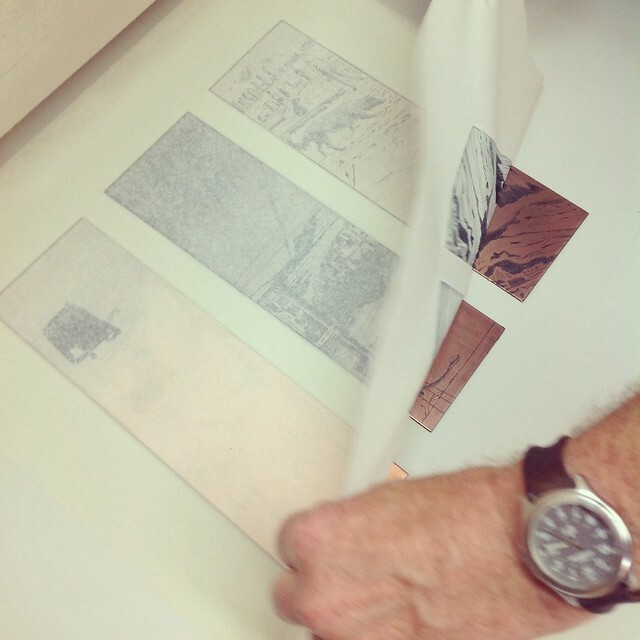 The master printer, Peter Braune of New Leaf Editions, is pulling “state proofs” of three copper plates for me. These proofs allow me to review how the image looks at a certain state in the drawing process, and as a consequence adjust my technique, correct the image, or continue developing the plate. All my etchings for this project are done on 3.5″ x 11″ copper plates, using a mix of drawing techniques involving hard ground, soft ground, drypoint, and aquatint. 5. 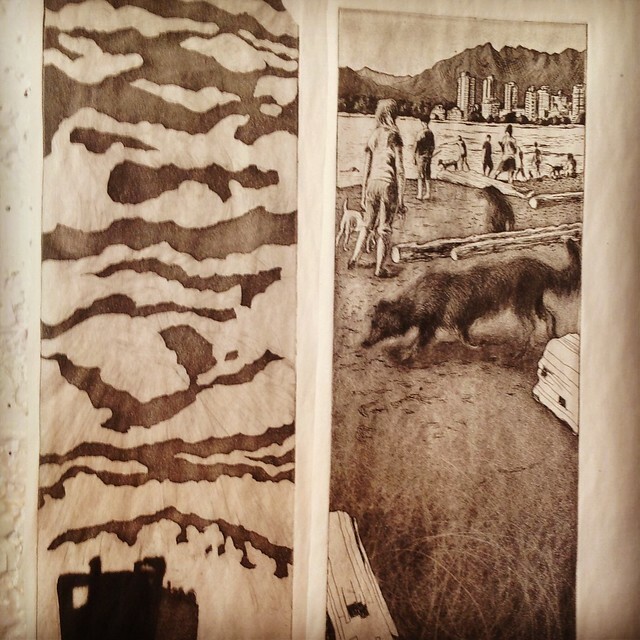 A look at “state proofs” of two of my etchings. These are usually done on newsprint which allows me to review fine detail on the plates and make corrections or continue drawing. All plates are worked on in reverse, of course, and it’s also often hard to predict how things will look when they are printed. This is why state proofs are an important stage in the copper plate drawing process. 6. When I have approved the last state proof and am happy with the copper plate, Peter etches the drawing into the plate using acid. 7. I can still work into the plate more after that point, additional etchings can be added such as more aquatints etc., I can burnish or do drypoint by scraping right into the plate, and review more state proofs. 8. At some point, there is a final state proof we’re all happy with, and we declare the plate done. 9. Then Peter electroplates the copper plates in steel to a) allow more copies to be printed from them due to steel being a harder metal, and b) to prevent the copper from reacting with the pigment in the ink and affecting the colour of the print. 10. Hand-printing on Arches Wove etching paper on a Takach Etching Press can begin. 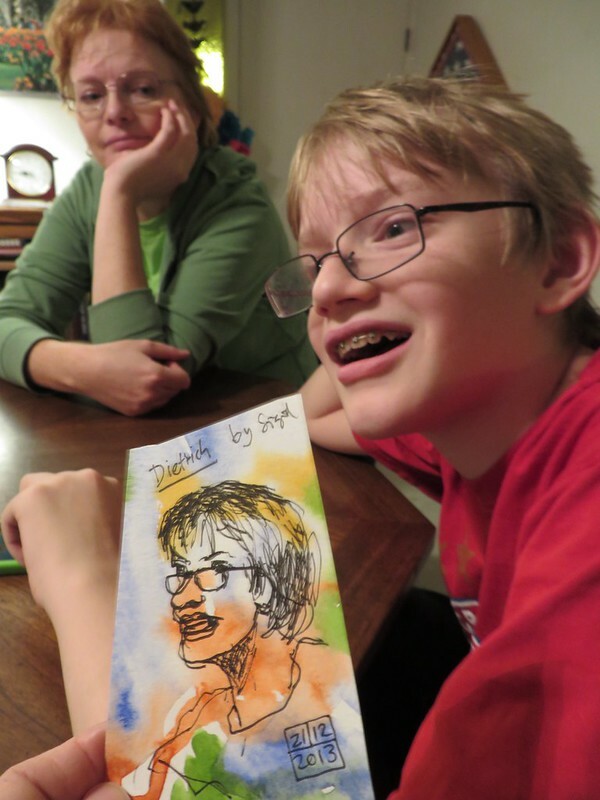 The book covers will be printed on custom designed paper made by local paper maker, Reg Lissel. The poems will be printed separately on a Vandercook Universal I, from polymer plates created at Blackstone Press. 11. The book will then be hand-assembled and the spine hand-sewn. 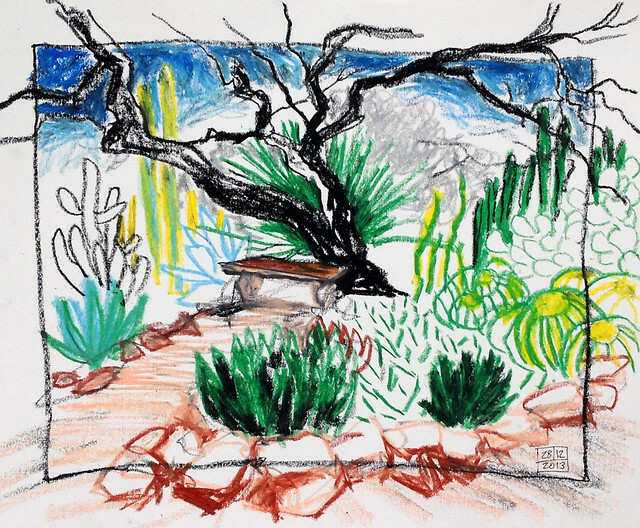 On December 28, I spent a few glorious hours by myself, drawing in the Tucson Botanical Gardens, a beautiful, quiet oasis in the city. 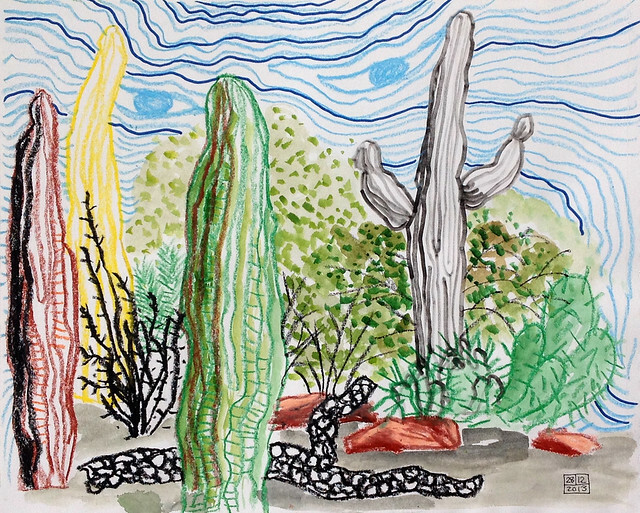 There’s an herb garden, a traditional Tohono O’odham Nation garden, a zen garden, a cactus garden, various contemplative gardens, a butterfly and orchid garden, and more. The first drawing below is a mix of oil pastel, thick Pitt marker, and watercolour. The saguaro cacti appear to have formed an illegal assembly. Maybe they are plotting something? Or maybe it’s all completely innocuous, and they’re just exchanging ideas on how to attract more bees. But seriously, I have noticed how sculptural these cacti, as well as a lot of other Arizona plants, are. They don’t seem to be as lush, flowy and soft as the plants we have in BC. This last drawing below is in oil pastel only. It was definitely inspired by Veronica Lawlor’s reportage drawing style (she teaches at the Pratt Institute and Parsons School of Design in New York), and one of her former students, Dino Pai, who participates with me in the Vancouver Urban Sketchers, and is a professional storyboard artist. One day, I hope to meet Veronica and take some kind of a drawing lesson from her. December 14 was the last Vancouver Urban Sketchers meeting before Christmas, and I made an 8-hour sketching session out of it. Well, almost, there was some socializing too. From 2 – 5 pm, 20(!) of us sketchers met at 33 Acres Brewing Company. They have a tasting room where they are allowed to sell glasses and growlers of their own beer, but no other alcohol or cooked foods. These urban breweries with their own tasting rooms are filling some kind of thirst in Vancouver as well as a loophole in the Byzantine liquor laws that we enjoy here in BC. These laws are finally under review. The “no cooked food” restriction is elegantly circumvented by allowing food trucks (also relatively new to Vancouver) to park outside these tasting rooms. These food trucks do not have a liquor license. A nice symbiotic relationship results between two BC-bureaucracy-crippled businesses. 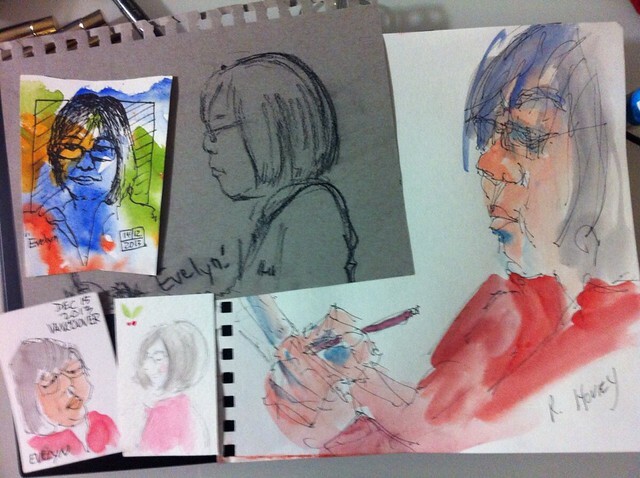 We had a visiting Urban Sketcher from Australia along, Evelyn Yee. 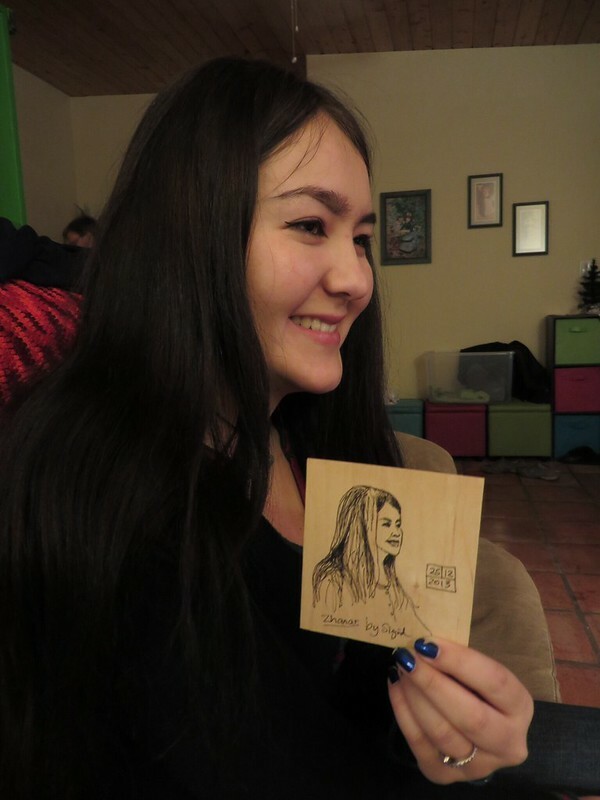 She made the suggestion that we draw quick, 5-minute portraits of each other on small, business-card-sized pieces of paper. I think most of us ended up doing that, and it was a lot of fun. The beer may have helped too. 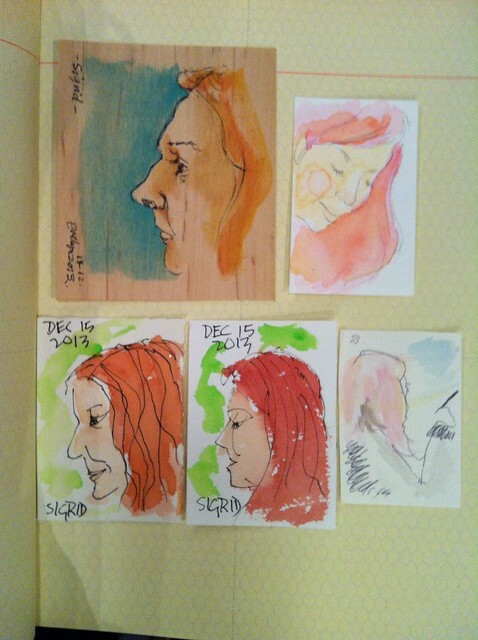 Sketches of Evelyn by various sketchers (the brightly coloured one at top left is by me — I created watercolour washes on small pieces of paper in advance. Sketches of me by various sketchers. At 5 pm, everyone took off, and Evelyn and I walked up and down Main Street in search of another warm place to hang out and sketch. We moved along to a Bean Around the World coffee shop, drew there until they closed at 8 pm, and then went to the Rocky Mountain Flatbread Company for pizza until they closed at 10 pm. On the way I showed Evelyn one of my favourite stores on Main Street, The Regional Assembly of Text. 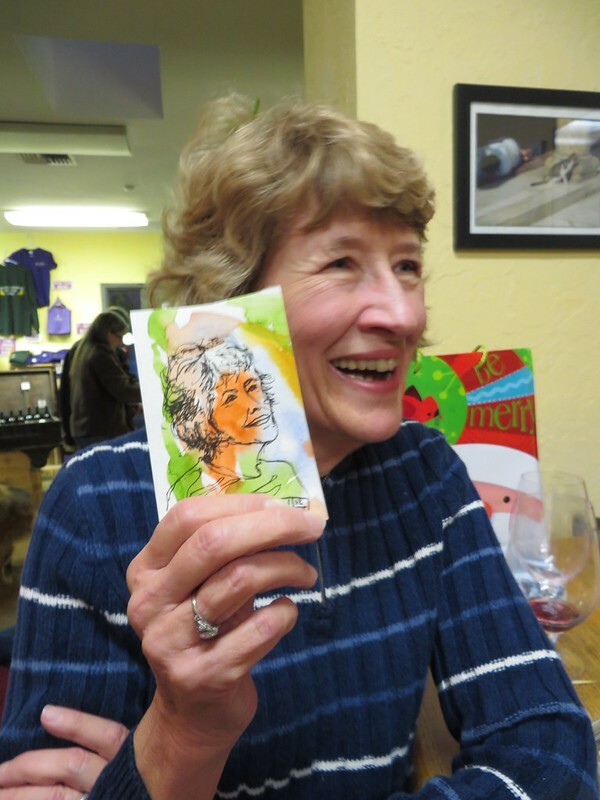 We had a great time talking and connecting over sketching, and the next day she had to catch a flight home to Melbourne.